A press article in Mancunian Gay, 1981 covering the opening of BLUES in Ashton, a leather/uniform club for gay men that took over from the Gaslight, a club opened for women by Joyce Edwards in 1973. 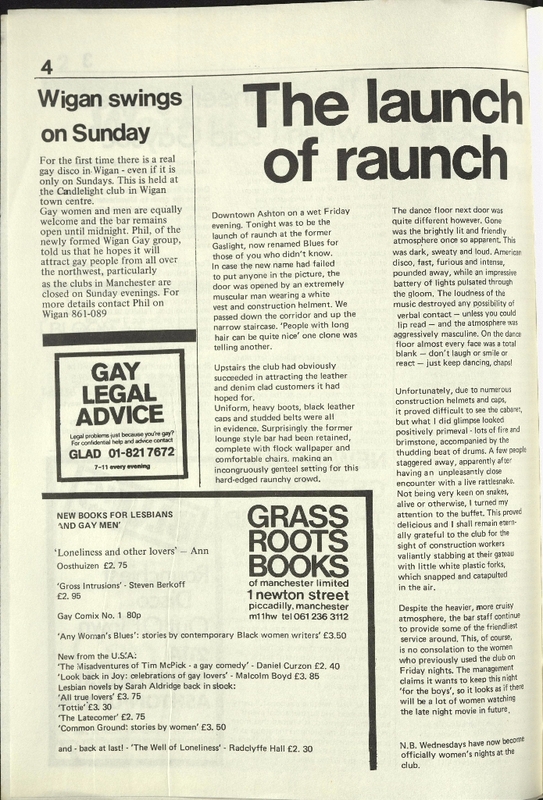 We also see an advert for Grass Roots Books - a vital hub for the political queer community Manchester, plus news of a gay night in Wigan. Our archive currently contains 3563 Bands, 674 DJs, 1294 Venues, 149 Industry Professionals and 18626 artefacts contributed by 3396 members.